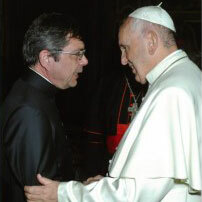 Fr Maurizio Pettena, Director, Australian Catholic Migrant and Refugee Office, meets Pope Francis at the Vatican. Welcoming the stranger, a characteristic of the early Church, thus remains a permanent feature of the Church of God. It is marked by the vocation to be in exile, in diaspora, dispersed among cultures and ethnic groups without ever identifying itself completely with any of these. Welcoming the stranger is thus intrinsic to the nature of the Church itself and bears witness to its fidelity to the gospel (Erga Migrantes, 22). The Catholic Church in Australia has long been at the forefront in the pastoral care of migrants and refugees. In 1944, the Australian Episcopal Conference created a sub-committee on Immigration. The sub-committee chaired by Bishop McGuire was appointed to look after the interests of Catholics with regard to immigration. Lay committees already formed under their respective Bishops in NSW and other states of Australia came under the direction of Bishop McGuire during 1944. Bishop McGuire and the sub-committee were aware that there was a strong determination by powerful influences to increase the population of Australia by means of immigration. It was a matter of waiting for the repatriation of servicemen and clarification of economic conditions before encouraging mass immigration to Australia. In response to a request from the Australian Government to have a Catholic body responsible for immigration matters, Bishop McGuire was granted approval to form the Federal Catholic Migration Committee (FCMC), later the Federal Catholic Immigration Committee (FCIC), by selecting its members and preparing a constitution. In April 1947 the committee was announced, although Western Australia already had a Catholic body called the Episcopal Migration and Welfare Association, which was responsible for barging out Catholic Migrant Children from the UK and accommodating them in orphanages in Western Australia. Catholic Migration Offices were opened in capital cities throughout Australia and State committees were formed of Archdiocesan and Diocesan representatives. The Federal Office opened in Sydney. The opening of these offices in 1947 coincided with the commencement of free and assisted migration to Australia. In the early part of the operation the work centred around British migrants and displaced persons many of whom were Catholics. During 1948 the flow of migrants to Australia continued to increase. Around this time, it became obvious that there was a need for priests from various nationalities to minister to migrants in their own language. The recruitment of overseas priests on an individual basis and need, determined by the local Bishops, commenced in 1948. The Australian Catholic Migrant and Refugee Office (ACMRO) was established by the Australian Catholic Bishops Conference on 1 July 1995. It took the place of two previous Conference bodies – The Federal Catholic Immigration Committee and The Australian Catholic Refugee Office – and assumed many of their functions. The Office reported to the ACBC through the Bishops Committee for Migrants and Refugees. Today, due to the new challenges we face, there is a greater emphasis about migrants and refugees than there was in the past. Consequently, this has led to another focus, the emphasis on education and awareness rising within the church at all levels. Aware of the challenges that lay ahead, the ACMRO team celebrates with gratitude to the Lord this anniversary. The ACMRO remembers with an immense debt of gratitude the leadership of the Bishop Delegates; Bishop Patrick Dogherty and Bishop Joseph Grech, the hard work of past ACMRO Directors Mons. Crennan and Mons. Murphy and the dedication of the many Staff who have been companions on this journey. The latest document, ‘Welcoming Christ in Refugees and Forcibly Displaced Persons‘, states what should be the way of the Church in considering and treating the stranger. In the “strangers”, the Church sees Christ who “pitches his tent among us” and “knocks at our door” [n. 22]. It also points out that very often, “through the action inspired by the Gospel of Church-related agencies, or even individuals, wrought with great generosity and self-sacrifice, one comes to know the love of Christ and the transforming power of its grace in these situations that are, in themselves, very often hopeless” [n. 3]. In the “strangers”, the Church sees Christ who “pitches his tent among us” and that “knocks at our door” [n. 22]. In the stranger, the Church hears the voice of Christ echoing within the very depth of our Christian identity: “I was a stranger and you welcomed me” (Mt 25:35).